PAS QuickNotes (QN) are plain-English briefing papers that explain planning basics for public officials and engaged citizens. Each QN offers a concise overview of a timely planning topic, plus links to more resources for further reading. The term unmanned aircraft system (UAS) refers to an unmanned aerial vehicle (UAV or “drone”), its remote controller, and (unless fully autonomous) its remote pilot. Because these systems can provide real-time visual or spatial information at a fraction of the cost of manned aircraft, a growing number of communities are exploring opportunities to integrate drones into their planning activities. 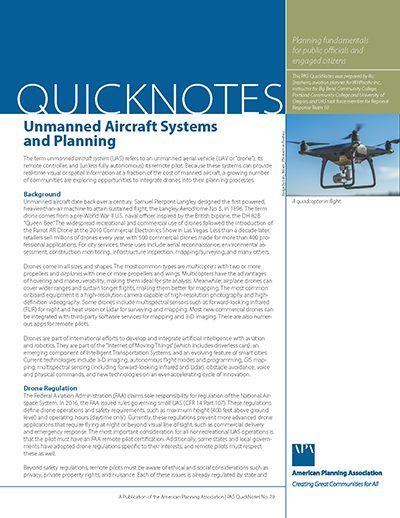 This edition of PAS QuickNotes provides a brief overview of drone technology and regulations and highlights three specific ways communities can use unmanned aircraft to improve planning processes. PAS QuickNotes are plain-English briefing papers that explain planning basics for public officials and engaged citizens. APA members and PAS subscribers have access to all PAS QuickNotes in the QN Archive. Feedback on PAS QuickNotes is welcome. Comment on the issues or suggest topics for upcoming editions. Are you a planner or authority in the field?